Summer is almost here in the southern Appalachian Mountains. Major bloomers not included before are the Mimosa (Albizia julibrissin) and the exotic invasive Crown Vetch (Securigera varia). i am out west for the next few weeks in route to the Rainbow Gathering and have already been introduced to new beings that occur in the unique flora out here. Some examples include Pin Cushion Plant (Navarretia), Bicolored Linanthus (Leptosiphon bicolor syn. Linanthus bicolor), Chinese Houses (Collinsia sp. ) and Brodiaea. Tomorrow is my 36th birthday and i will be facilitating a walk at a very special gathering in northern California that used to be attended by my friend and teacher Frank Cook. What plants around you are in flower or fruit? Include a few down below in the commentary section if you get a chance. 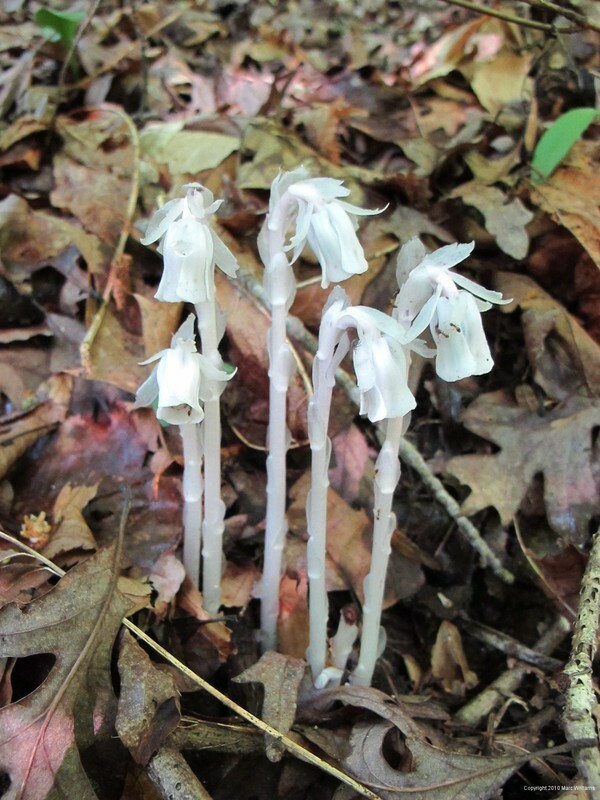 Not all plants are green and photosynthesize as can be seen by this Ghostpipe to the right (Monotropa uniflora) which i recently saw blooming around Boone, NC. Since the last class i attended an incredible conference for the first time. The Medicines From the Earth Conference www.botanicalmedicine.org/conferences/me2011/me2011genl.htm proved to be an incredible learning and networking opportunity. It is always a great joy to see Dr. Jim Duke in action. A special treat was to see him play many songs that he has composed over the years. Since he is a botanist plants are often the protagonist in his lyrics. Some he paid homage to included Ginseng, Elderberry, Wintergreen, May Apple, Maple Syrup, Ground Nuts and Evening Primrose. You know it must have a special plant story to inspire Jim to write about them. Maybe you will be inspired to look deeper into some of the plants mentioned here? Jim also sang a couple of poignant songs to honor the Amazon Forest and Frank Cook…. As part of my entrance to the conference i did a work trade assisting my friend and teacher 7 Song in a field botany intensive. The mission was to pick him up at the airport and immediately go and pick flowers for the next day’s class. On the way i picked up some Winged Everlasting Pea ( Lathyrus latifolius ), Poor Person’s Pepper pods ( Lepidium ). It was at first hard to think of where we could pick the most diversity for the class from the wild. However, the farm of friends Anne and Aaron Grier www.gaininggroundfarm-nc.com came to mind. Anne has always been my favorite flower farmer of the area and until recently was a neighbor as well. She gracefully offered her fields both wild and cultivated for the picking and we happily brought our collection to over 20 species. A visit to good mutual friend Juliet Blankespoor and some roadside collecting of Deptford Pink (Dianthus armeria) New Jersey Tea (Ceanothus americanus), and Queen Anne’s Lace (Daucus carota) brought our total to over 30 species. The class went well and i feel immensely grateful to the Medicine’s from the Earth folks for a chance to work hard using my specific skills in exchange for education in an incredible environment. Numerous other incredible teachers were present and i took classes with Jim Duke PhD, Ryan Drum PhD, Mark Blumenthal, Jillian Stansbury ND, David Winston, and Cascade Anderson Gellar. My focus drew me naturally to teachers from outside the region primarily coming from the Northwest and Northeast. Many other great teachers were present that i did not have time to see. Local folks like Doug Elliot were also holding forth which is always good to know. This past weekend i taught twice around the Boone area. Once was around Vilas and the second was by the Kerr Scott Dam in Wilkesboro. The Vilas walk was a sweet mix of mostly native Appalachian species already covered elsewhere with the class of good friend and teacher Serene Dae Rawl. The Dam walk was for a private group. It was a rather acidic ecosystem consisting mainly of Pines (Pinus spp. ), Red Maple (Acer rubrum), and Rhododendron (Rhododendron spp.). Some Oak (Quercus spp. )and a good bit of Beech (Fagus grandifolia) grew on nicer sites or near the water. To see a type of Skullcap (Scutellaria sp.) blooming was a highlight. Most of these plants have distinctive flowers that are easy to distinguish. However in the Lamiales order i.e. (Lamiaceae, Scrophulariaceae, Verbenaceae, Plataginaceae) it can get tricky especially in the tropics where several more families join the party. Most of the Peas, Violets and Touch me Nots are rather apparent when in flower. Many of these plants with tubular flowers have distinct inflorescences that make it easy to place them in a family. Flowers are by far the easiest way to determine a plant but the goal overtime is to build a portfolio of characteristics including growth habit, leaf orientation, leaf form, color, hairiness, smell, fruit characteristics, bark, sap, etc. Just notice characteristics and differences…attention to detail is key. The vocabulary of botany can take you as far as you want to go. A flora may feature hundreds of technical terms. However, with the knowledge above and practice with these keys in Botany in a Day you can go really far toward a practical understanding of the plants around you. Below are items to think about/comment on. Please write me directly at marc@botanyeveryday.com or leave information in the commentary under this class. Save your comment before submitting if possible as sometimes our spam filter seems to reject them which seems connected to how much time you take to submit.. i would really love to hear what you have to say!! !